So our first house is pretty standard for the neighborhood: 30-something year old split level with shutters and ho-hum landscaping (on our giant to-do list) on a corner lot. The hubby and I both have laundry lists of things we would like to do to the house to make it “ours”… among those things is the outside of the house. As I drive through the neighborhood each day I notice the “curb appeal” throughout. So I got to thinking… The inside is for us. We can take all the time in the world to experiment with furniture arrangements, paint one room at a time, hang pictures, arrange books on shelves and so on. But the outside of our home is the welcome mat to the rest. The hubby and I hadn’t initially discussed how we felt about living on a corner so I was surprised when he expressed that he felt it was a “con” for him about the property. I actually thought a corner lot would be great… I love that the first impression of the home is the front of the house: sidewalk, shutters, front stoop and door. I love that visitors are first greeted by the front door … THEN they see the driveway and garage doors. So garage doors aren’t in the forefront. The front door is. 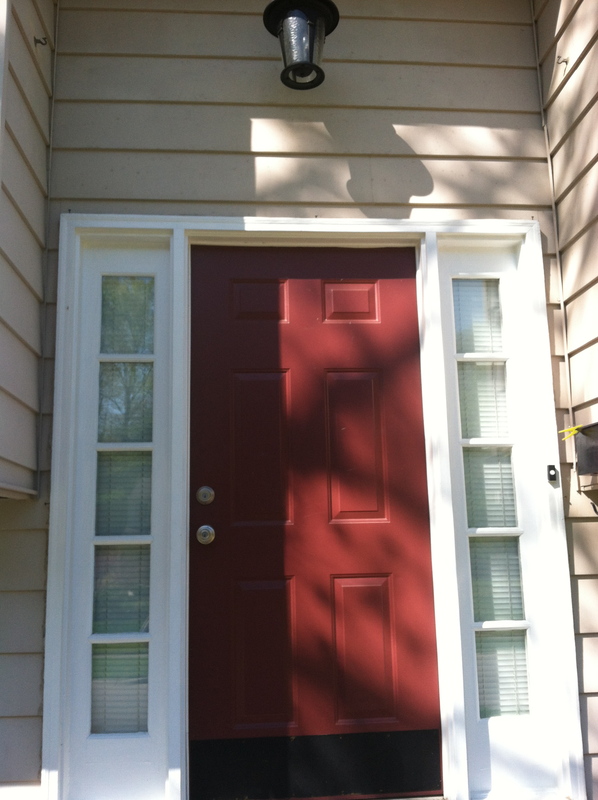 When we moved into the house, the door was a not-super-ugly but far-from-impressive burgundy (so was one lonely wall in the family room- but thats a whole different post). Most of the houses in our neighborhood don a similar red while others stick to hunter green, creams and browns. But burgundy seems to be the boldest color chosen. We decided that our house needed some personality. After some debate and some pinteresting (as usual)… the hubby and I started talking about deep ocean teals and gray-blues. Let me remind you that I grew up in a purple victorian house. Even now my parents’ house (not the purple one) has a vibrant grape front door. I’m not afraid of color. I wish I could say the same for Hubby. And so we made our seemingly weekly pilgrimage to Home Depot and chose a handful of deep Caribbean jewel tones. 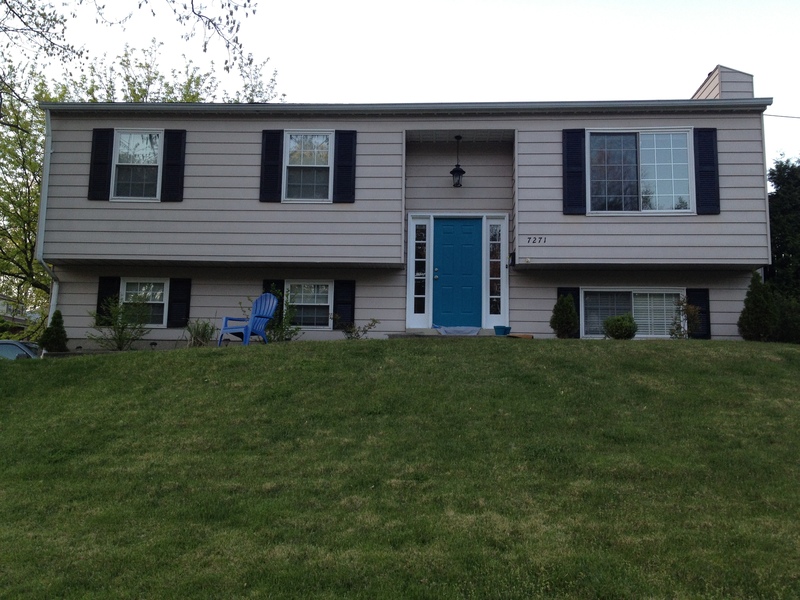 We settled on “Caribe” Behr exterior paint with primer in it. I spent an afternoon lightly sanding the door, wiping away grime and taping off hardware. The hubby leant me his tools but knew better than to hang around any longer than that. 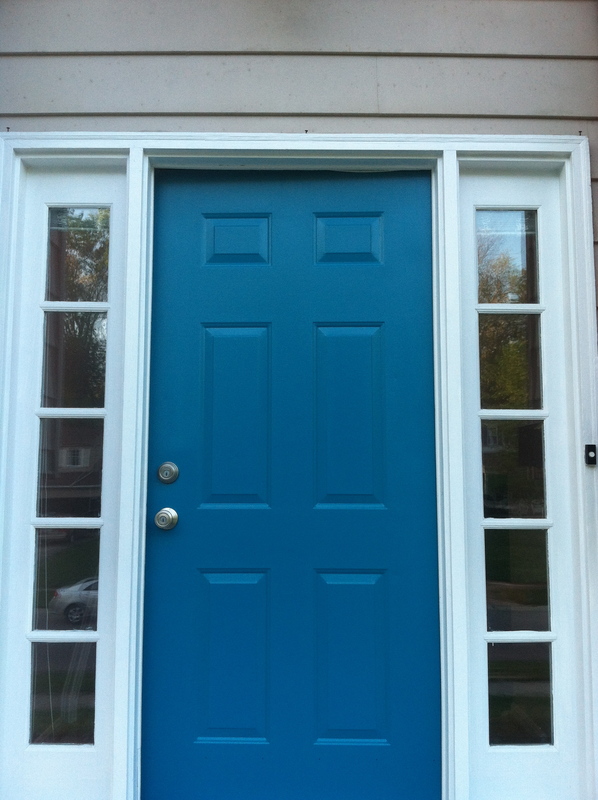 And by the time he was finished with a Call of Duty marathon, I had completed our new door. 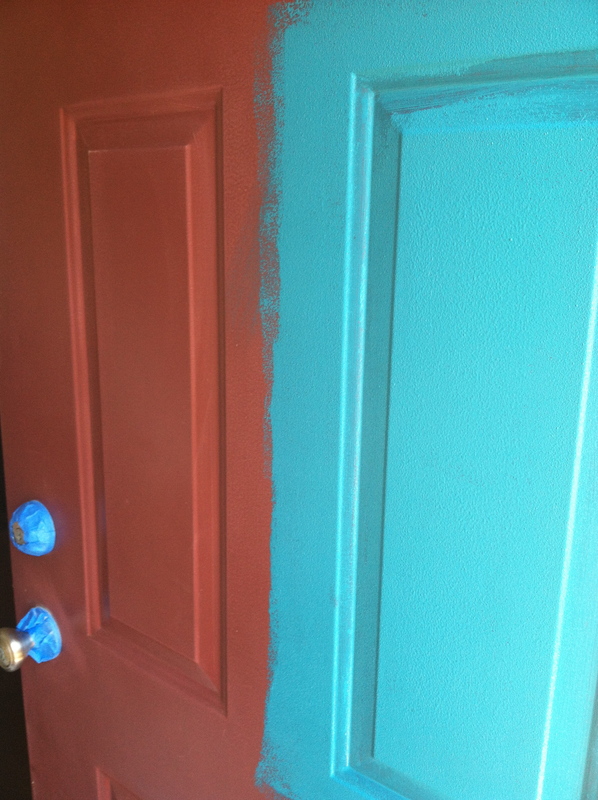 In fact, not only did I paint the outside of the door, I painted the inside too. Nobody every does that. I don’t even know what possessed me to do it. But its awfully cheery in our foyer now. I highly recommend it. Tada! Pretty bright. Admittedly brighter than expected. We actually stood in the driveway across the street and chatted for about 20 minutes trying to decide if we were too daring. We agreed to sleep on it… and we were back in the neighbor’s driveway the very next morning. The verdict is to keep it. However, we are seriously considering painting the trim around the entry black for a more cohesive look. Check back for pictures next week. Here is the view from across the street. After he took this, the hubby was flagged down by the woman who lives there. She raved and raved about our bravery and taste. I’m glad she likes it so much, she’s the one who has to look at it the most. And just yesterday two joggers stopped to tell me they adore it. Its growing on us more each day. Oh what a difference a can of paint can make, this looks good.